SALT LAKE CITY (AP) The New Orleans Pelicans are ahead of the Utah Jazz in the Western Conference standings but haven’t had recent success head-to-head. That changed with a complete performance on Wednesday night. Anthony Davis had 29 points and 15 rebounds, and the Pelicans snapped a five-game losing streak against the Jazz with a 108-98 victory. ”Once we share the basketball and just play for each other on both ends of the floor, then we’re a tough team to beat,” Davis said. ”Sometimes, we play on one end of the floor and not the other. When we play for a full 48 minutes on both ends, then we give ourselves a chance to win every game. Jrue Holiday carried the offense early with 18 first-half points and finished with 24 for the Pelicans. DeMarcus Cousins added 19 points and 11 rebounds. Donovan Mitchell led the Jazz with 24 points, and Joe Johnson scored 20 off the bench. 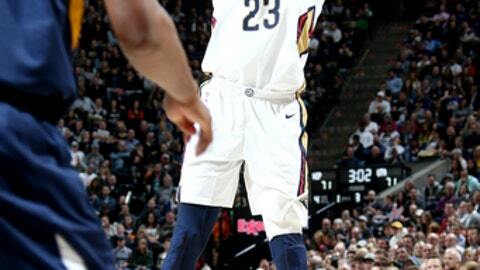 ”We did a good job of moving the basketball and then I thought we were really good defensively, especially taking away Mitchell after what he did to us the last game,” Pelicans coach Alvin Gentry said. The Pelicans came in ranked 6th in the league in 3-point shooting, and they went 14-for-30 (46.7 percent) from beyond the arc. The Jazz made just 7 of 32 (21.9 percent) from 3-point range. ”When you see teams shoot 50 percent from the 3-point line, roughly, you’ve got to do a better job of it,” Jazz coach Quin Snyder said. ”We had some other situations where we just didn’t close out just as aggressively enough. The game went back and forth before the Pelicans closed the third quarter on a 12-1 run, including seven points from Davis. Dante Cunningham’s three-point play to start the fourth put New Orleans up by 12, its biggest lead. Utah responded with a 9-0 run, but Davis slammed the door with 10 fourth-quarter points. ”We’ve got to play with extra energy and play with an assertiveness, and I don’t think we did too much tonight,” Mitchell said. Pelicans: Cousins left with 8 minutes left in the first quarter after an awkward landing. He went to the locker room before returning about three minutes later. Jazz: Jonas Jerebko started at power forward after playing just four minutes in Utah’s last game and not at all in the one before that. Snyder has rotated minutes at that spot between Jerebko, Thabo Sefolosha and Ekpe Udoh. The Jazz and Pelicans face off two more times this season. Utah won the first meeting in December. Snyder said head-to-head matchups with teams competing for similar playoff position carry a little more weight. ”They matter. They matter more when you look back on them,” Snyder said. ”We play these guys more, too. There’s always more of those, so to speak, until you get late in the year. The players are aware. They know the standings and they know where teams are. I do too. Pelicans: Travel to face Karl-Anthony Towns and the Minnesota Timberwolves on Saturday. Jazz: Travel to face Nikola Jokic and the Denver Nuggets on Friday.